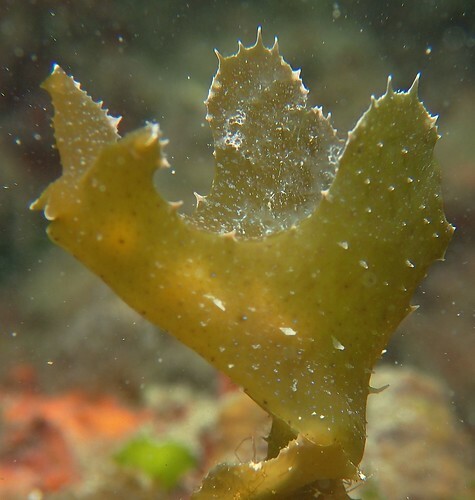 One of the highlights of the night was this Sargassum nudibranch (Crosslandia sp.). 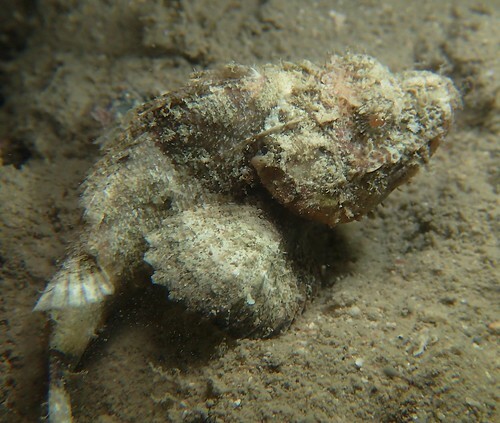 Isn’t its camouflage simply remarkable!? Saw lots of wonderful critters and met a few long lost friends! Found the Sargassum nudibranch (Crosslandia sp.) after many years since my last sighting at St John’s Island! 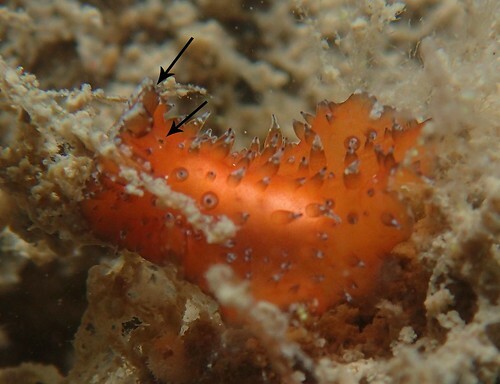 Another highlight was this Okenia nudibranch, which Chay Hoon last saw in 2013! This goes to show that the only way to find something is to keep on hunting! With camera of course. Often in our wild places, just because you don’t see something doesn’t mean it’s not there. There are tons of places for critters to hide, and for many of them we don’t yet know much about what influences their presence or absence. 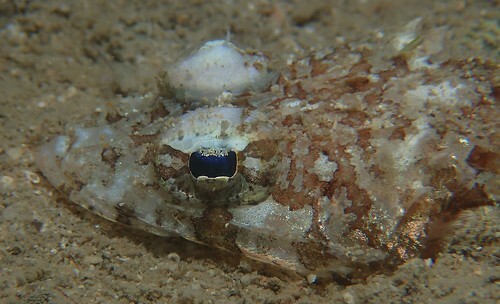 Cuttlefish camouflaged as a sponge. Flatworm looking like a sponge. 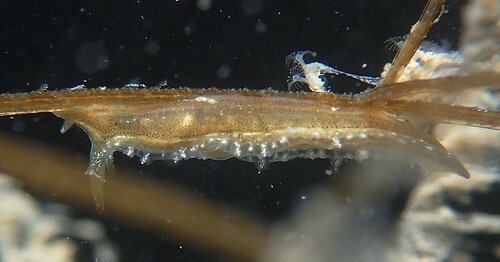 The arrows point at its pseudotentacles and cerebral eyespots, which tells us that is it indeed a flatworm! Thanks to Rene Ong from TMSI for help with this! 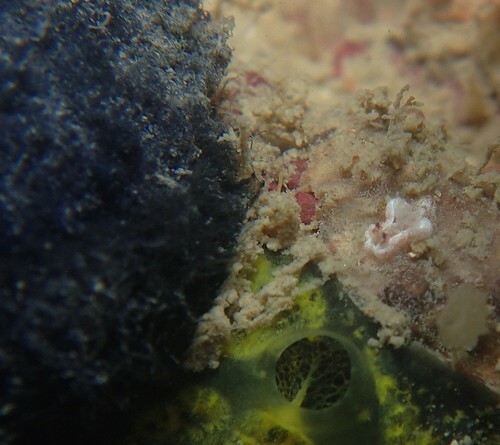 A cute little baby scorpionfish looking like a piece of coral rubble. Even though coral rubble may just be dead coral, it still serves as an important habitat for many species which have evolved to thrive in this unique environment! Just because it’s dead doesn’t mean it’s worthless! 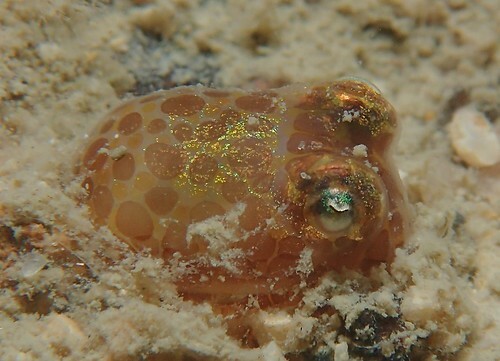 Flatheads like the one above adopt another strategy – burying themselves in the sand to avoid detection. This one is only half buried. Here’s a closer look at its mesmerising eyes. Not just some algae and hydroids, this master of camouflage is in fact a nudibranch, Lomanotus vermiformis. If you are wondering how Chay Hoon manages to find all these creatures its because she reads a lot! By constantly looking at photographs of these animals in books, and learning about their habitats, she has honed her skill to recognise even the subtlest patterns in nature. Not only can she see that these are animals against an environment, she also knows their names and diet (which is often closely related to their habitat). She couples all these reading with a tremendous amount of time in the field, getting familiar with landscapes. 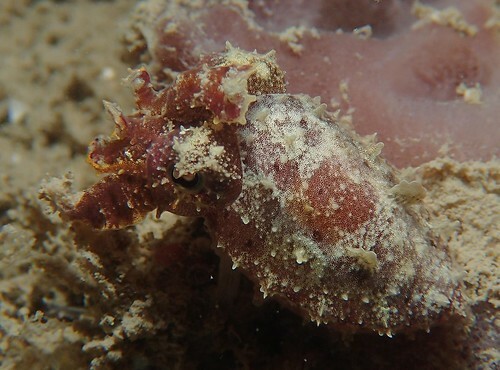 Of course, she is also a master hunter of nudibranchs! We are privileged to be able to share her images! Doto greenamyeri is a favourite amongst Singapore’s macro photographers. 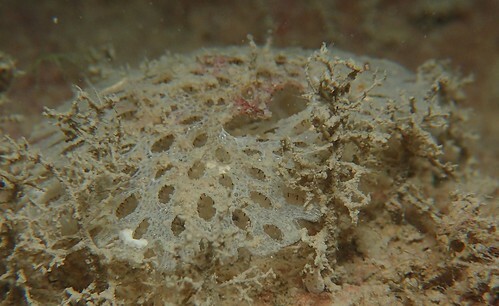 Bryozoan Hut. Awww. Isn’t it cute? 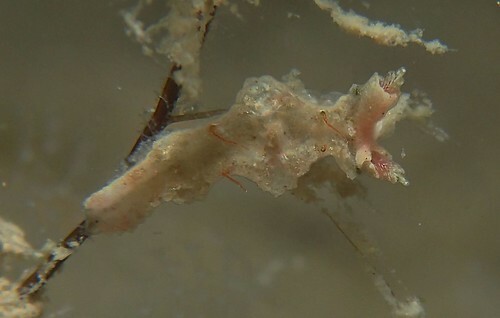 Eubranchus nudibranch on a hydroid. 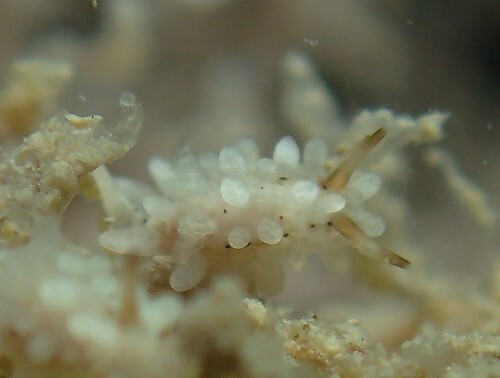 The nudibranch Lomanotus sp. 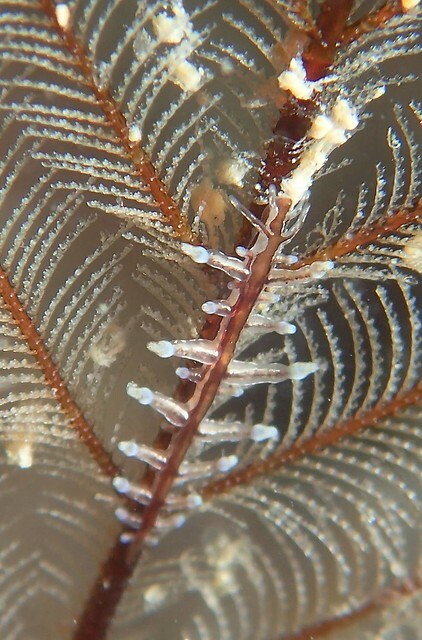 also on a hydroid. 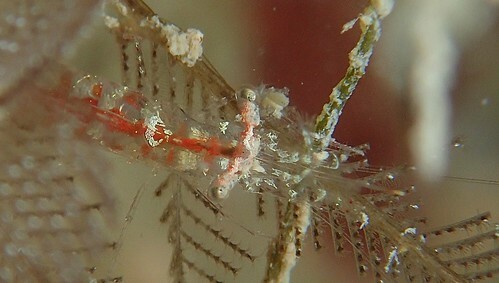 Let us not forget about another animals, such as this tiny little shrimp. We’re going to end this post with a very tiny (2mm) Goniodoris sp. 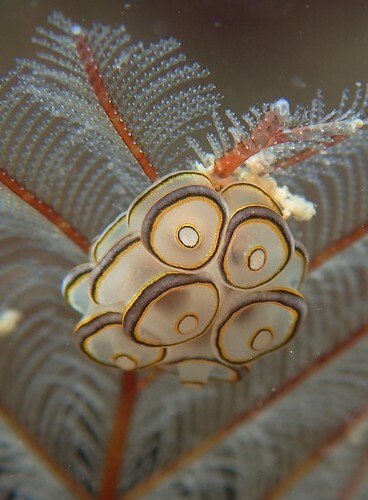 nudibranch pictured next to the tip of Chay Hoons finger. To see all the photos from this dive, browse through our gallery by clicking the arrow on the right of this image! Like what you see? What to see it in the flesh? Join us for a dive!